So last weekend (the 21st of September) was our Artifacts of a Life event here in the East Kingdom. There were some some amazing displays there! 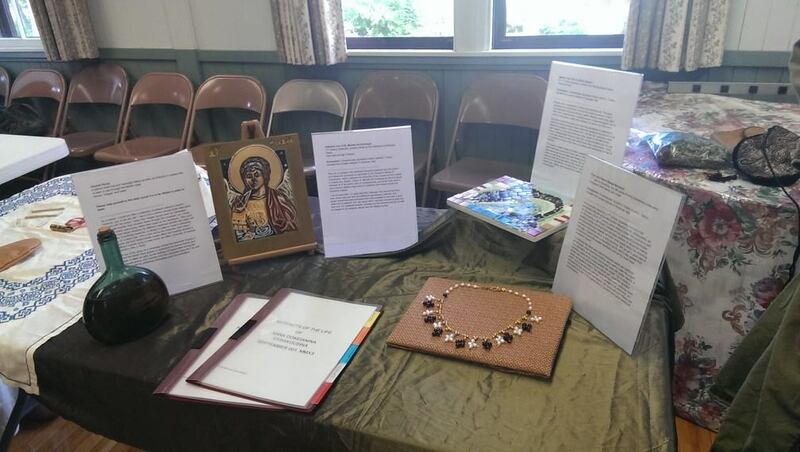 Left to Right: Oxymel syrup, Icon of St. Michael the Archangel, Mosaic of a Black Dolphin, and a necklace of garnets and pearls based on one at the Met. 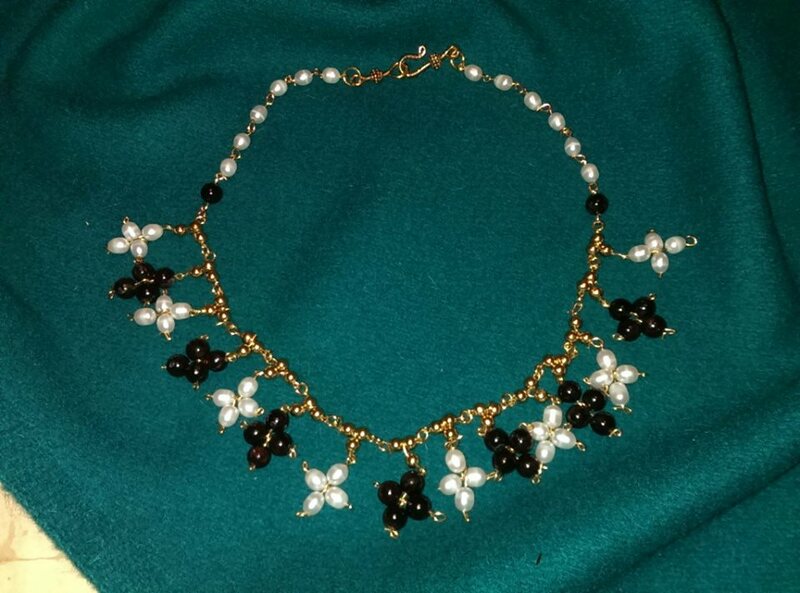 Here is a close up of the necklace. I totally failed in posting updates of me making it, but it took 2 seasons of Sons of Anarchy marathoning in the background to emulate the look. I swear my fingers still hurt looking at it. I tried to get a little bit of everything, namely aspects of a Byzantine life: Spiritual, Temporal, Wealth, and Food/Drink. I tied it together with that silly backstory I previously posted. IN VINO VERITAS VI: There is truth. The Muscat is in the fridge. The Conditum Paradoxum is upright and settling out. (It clarified while cellared.) I will need to re-rack it before Great Northeastern War this weekend. I am EXTREMELY excited about my first chance to panel in the East Kingdom Brewer’s Guild. I’ve been dabbling with my local guild: The Smokingbridge Guild of Libation Brewers, for a while now, but I never thought to bring it to the Kingdom level until I got these beverages done. I will be paneling my Conditum Paradoxum along side a short mead, rose and lavender cordial, and my pomegranate balsamic sekanjabin if there are enough slots open for all 4. I’d like to thank Mistress Bess Darnley for taking a moment to look over my documentation and providing feedback. YES! The Rosatum and Retsina are done and bottled and delicious! I can’t wait til these age. They’re going to be remarkable. That is probably the worst movie/history pun crossover in the entire internets. Anyways, we have wine! First you gotta sanitize those bottles. We may be making Roman wine, but we don’t need Roman germs. Then you make your boyfriend put the carboy on the counter for you. It’s so clear, you can see from here to Guinness. BRILLIANT! Once you siphen into the bottling bucket (best money ever spent, ever deal with bottling out of a carboy? Ung.) separate off the small batches of infused wines. Here is the Retsina with pieces of pine resin in the bottom, and the Rhosatum, with dried roses in a bag infusing in the pickle jar. These should be bottled by the end of the month. Pliny says to leave the roses in there for 3 months, but I’m assuming he meant fresh. I’m using dried, so I’d rather monitor what this is going to do and the flavor I’m going to get before creating a mess. Retsina (resin) and Rhosatum (rose) wines. I also separated my portion off for the Conditum Paradoxum, the spiced wine from Apicius. After gathering my ingredients, it all went into the pot for an hour on low heat to steep. The pine resin melted fast, which got me worried, but it was fine. You can see the odd mix of ingredients here: dates, melting resin, bay leaf, saffron, black pepper, honey, and I threw in a cinnamon stick for fun and profit. And my stove is filthy. Welcome to brewing. Once that was infused with the rest of the wine, it was strained and bottled. 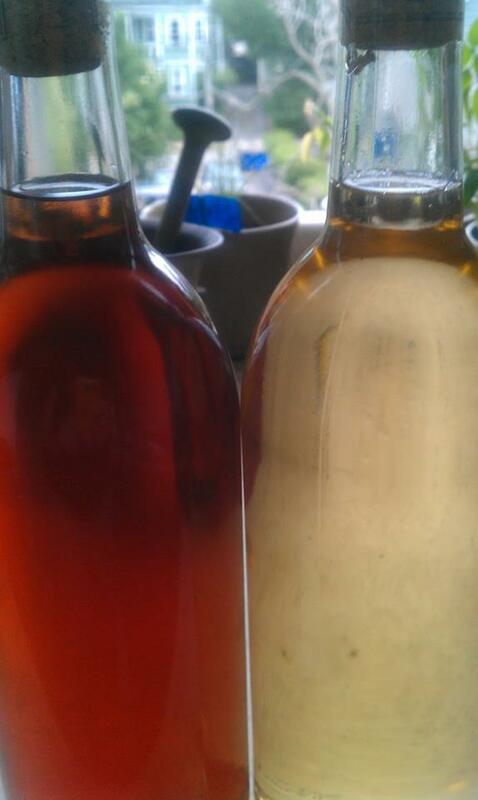 Here is the Conditum in the bottles next to the unaltered muscat wine I made. Conditum on the left, plain wine on the right. You can see how the spices clouded the wine. So, being the brave soul I am, I tried the Conditum in the period style, using warm saltwater to dilute it, as the straight liquor is extremely sweet. The dilution cleared the wine, and brought out the infused flavors. From Familia Annae to yours, EU! Bottling and infusing the wine today! Excited! Pictures to follow in tonight’s post. 2 gallons of “Ancient White” Muscat wine. I’ve found a couple different redactions of the Conditum Paradoxum. I have one written down in my brewing journal (this is a must-have for anyone who brews as much as I do. I conjure up recipes and write them in, and track my progress on existing projects) but I found a different approach online I may go with instead. The basis of the drink is that you take a base wine, Apicius doesn’t say what color though both reds and whites were widely consumed by the Romans, and you make a must of honey, saffron, mastic, bay leaf, black pepper and dates. I don’t have any mastic, so I’m subbing in cinnamon. Plus, with my Retsina, I didn’t want to overdo it with that flavor. I *DO* have plenty of pine resin to work with, so that is still an option. The rhosatum is getting treated exactly as Pliny says: put rose petals in a bag, put it in the must, close the sucker up and then let it sit for 3 months. I’m assuming he means fresh petals, and I’m using dried, so I’m going to be monitoring the color of the liquor and making sure nothing goes funky in there. If I stop the infusion early, I stop it early. No big. The Retsina doesn’t have a clear cut recipe. I’m more or less trying to re-create a flavor profile than an actual recipe. Originally, Greek and Roman wines got the resin flavor from the use of pine resin as a sealant on the amphorae. Being that I don’t have an amphora, (I’ve looked, they’re expensive to get made) I’m cheating and tossing an ounce of resin in the wine and letting it age a month. If this works out, I’ll bottle the wine and seal the top of the bottles with resin like wax as a nice touch. More updates today as it comes, live, from Black Dolphin Brewing! In Vino Veritas Part III, and Artisanal Swapage. Racked the wine to the secondary today. It’s fermenting like a madwoman. I probably could have let it go longer, but the boy needed the larger carboy for his beer that he’s working on today. Either way, I plan to leave it in this carboy now for at least a month before the clarifying process. I picked up another 1 gallon jug today as well, now I have 2, which will be important for when I do my separate infusions of the rose and resin. As of this point, I’m not thinking they will be ready for paneling at War of the Roses (Memorial Day weekend) so at the earliest I should have a drinkable product by Pennsic, and especially good next year, as I intend to age as much as possible. It is wine after all. Though the Romans did drink a lot of young wine. Mostly because it was the primary beverage of choice, and though there were period winos (Pliny most certainly one of them) that did enjoy ages wines, there is no harm in younger beverages. I am also involved in the East Kingdom Artisanal Swap for my second round. That gift has been finalized, and I am working on getting everything together to complete it. 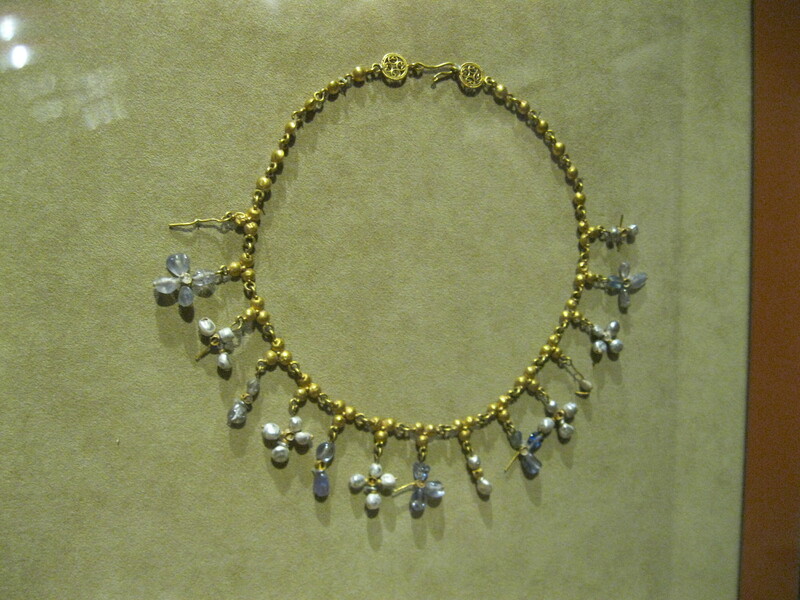 My previous swap gift went to Konstantia Kaloethina in Calontir, the founder of the NL swap, and I made for her a Byzantine Superhumeral out of shot purple silk, with some amethyst and pearl beadwork. I left it plain since we had discussed prior to me even having her as a swap recipient that she wanted one to adorn with her award medallions, but did not know how to sew one for herself. I received in the swap a lovely wooden chest with my arms on it, and a couple of brass and bronze medallions from Sir Yessunge Altan, I was blown away. You can see the type of work that goes into these swaps, this is why I’m so excited for NL, being limited to 40 participants, and worldwide. I do love a challenge!